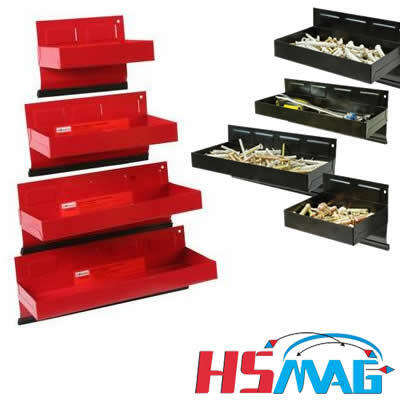 These HSMAG magnetic tool tray can make any magnetic surface your own personal toolbox. The rugged steel construction of this tray has spot welded seams for an extremely light and strong build and has a high-quality black or red painted finish powder coating that can withstand the everyday rigors of the garage. The neodymium or ceramic magnets on the back, some of the strongest available, provide a solid yet reliable attachment to a magnetic surface. The rubber coatings on the mounting surfaces keep the magnetic tray from sliding around and scratching the surfaces that it’s applied to. It also has a rubber coated foot that increases the holding capacity by using the magnets more efficiently by converting the force being applied to the magnets as a direct pulling force instead of a sliding force like most other magnetic trays. Magnetic tray is for storage of nuts, bolts, screws, etc. whilst working. Magnetic Tray has rubber protected magnetic back for affixing to vertical metal objects such as vehicle bodywork, tool boxes etc. with rubber protection bumper on base. Magnetism transfers to inner surface of tray to retain small metal parts, nuts, bolts, etc. Holds upto screwdrivers or similar. Rubber coated magnets to prevent surface scratching damage. Please note the Magnetics on this organiser are extremely strong.